Shane Heal says the Andrew Bogut signing is great for the NBL. BOOMERS legend Shane Heal says Andrew Bogut's decision to sign with the Sydney Kings in the NBL will help him shore up a role at the 2020 Tokyo Olympics. And he says the Kings are now the NBL title favourites. After a week of rumour, the NBL announced on Sunday night that the Melbourne-born former No.1 NBA draft pick would don Kings' colours next season. And Heal says the 33-year-old will be targeting Tokyo as part of his decision to stay Down Under. "I reckon that the NBL season is perfect for him because there are fewer games (than the NBA) and I think it's a real key for him to try to play for Australia again," Heal, a former coach of the Kings, said. "I think he'll play at the next Olympics - his locker room presence and his experience and ability to mentor young kids is huge. "Other people will argue that there will be players that could be more dominant, but they won't take into consideration what he can do in the locker room and I think that's critical. "When you've got so many guys coming through the NBA now - (star Australian-born Philadelphia rookie Ben) Simmons and that are still kids - they look up to him and say 'here's a guy that's won an NBA title and that's what I want to do'. He's had a great career, he was a No.1 pick so he can mentor those sort of guys and bring them together. "I also think the coaches would love having Bogut there because he's an extension of the coach." Heal says Bogut - who won an NBA championship with Golden State - instantly makes the Kings title favourites and will put bums on seats across all NBL arenas. 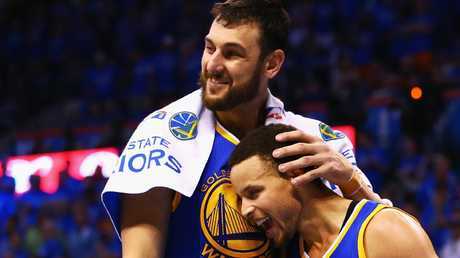 Andrew Bogut celebrates with Stephen Curry after the Warriors won the 2013 title. 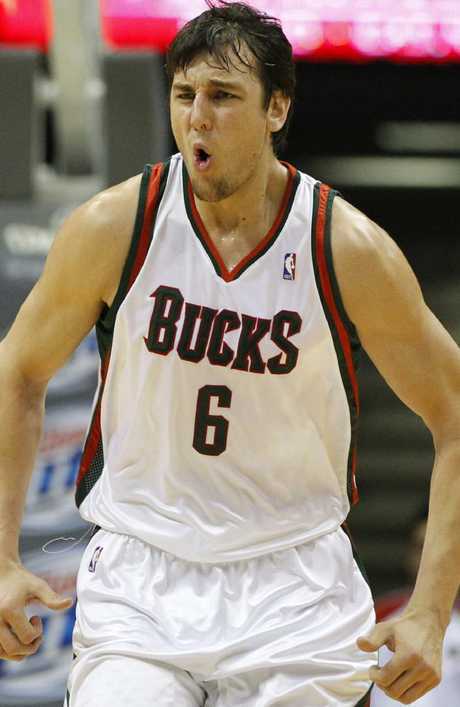 Andrew Bogut was the No.1 draft pick for the Bucks in 2005. "The think that we expect from a team that Bogut plays with is to win," Heal said. "The Sydney Kings, who have had so many big signings and blown the salary cap up over the years, but then haven't been able to translate that into wins, are now title favourites. "It won't be from points and rebounds from Bogut, it will be because he's a winner. He's so much bigger, he's stronger, he's smarter, he's experienced, he's great in the locker room, great for accountability and I just think this takes it to a whole other level because we have never had someone of this level playing in our league. "Wherever the Sydney Kings play on the road, their crowds will increase, people are going to sign up for season tickets in Sydney, this is huge for the league." Heal says Bogut provides more legitimacy to the NBL at a time when it's popularity is growing. "I think he's earnt so much respect and I think what it does is it sends a message to the rest of the population that the NBL's legit," he said. "This is a great league and now you've got somebody who doesn't really care what he says, he's great on social media, he's got a great personality and a profile to go with it. Bogut finds himself on a team that finished second-last on the NBL ladder last season, but will combine with former MVP Jerome Randle and Boomers Kevin Lisch and Brad Newley on one of the most talented rosters in the game. 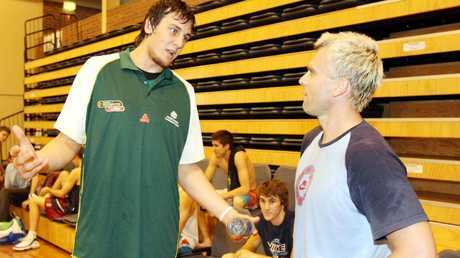 Andrew Bogut could well have prolonged his Boomers career with the move. Heal says the homecoming has come at the perfect time and his long injury history has taken some miles off his 213cm, 118kg body. "When you get older (in the NBA or Europe), you normally transition back to your own country and I'm happy he's been able to do that at a time when he can contribute and play some great basketball because he's not an old guy," Heal said. "Because he has had some injuries, I think it's given him more time and given him a break from the wear and tear on his body." 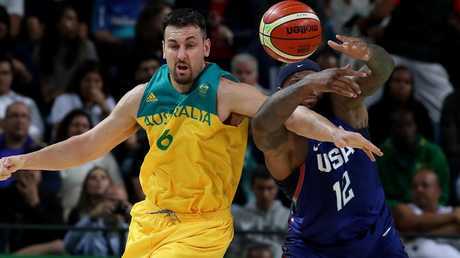 After being cut by the Lakers in January, Bogut had hoped to tack on with a contending team, but chose to return to Melbourne after the death of his grandfather, Mile Bogut, and stayed to support wife Jessica O'Sullivan during her pregnancy, which was deemed "high risk". He played 13 seasons with five clubs, the majority with Milwaukee, which made him the No.1 draft pick in 2005. A press conference to unveil the leagues new marquee man will be held in Sydney on Monday.